Hayes, D.C., S.L. Stout, R.H. Crawford, A.P. Hoover. 2014. 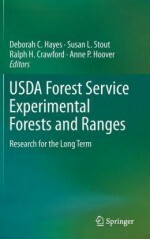 USDA Forest Service Experimental Forests and Ranges: Research for the Long Term. Springer. 672 p.
US Forest Service Experimental Forests (EFs) and Long Term Ecological Research (LTER) sites have had fairly tight synergies over their shared histories. Five LTER sites (Andrews in Oregon, Bonanza Creek in Alaska, Coweeta in Georgia, Hubbard Brook in New Hampshire, and Luquillo in Puerto Rico) are grounded on EFs with decades of earlier ecosystem and watershed research. These sites plus a sixth, Baltimore Ecosystem Study, have substantial participation by Forest Service scientists and other staff. Although the earliest of the now 81 experimental forests and ranges was established more than a century ago, the EF system has drawn lessons from the younger LTER network (now celebrating our 35th birthday) in terms of how to conduct network science. And the EF and LTER networks teamed up in a variety of ways, such as creation of the hydrology, climate, and stream chemistry data harvester systems. This recent book documenting history and accomplishments of the EF system covers a wide array of topics that are of interest to LTER scientists, leaders, students, and collaborators. The book begins with a historian’s perspective of the EF system, and subsequent chapters blend descriptions of accomplishments of individual sites, including Hubbard Brook and Luquillo, and multi-site overview chapters on topics such as biogeochemistry, soils, hydrology, social science, public outreach programs, and the move into urban ecosystems. LTER has a place in each. A chapter on network science distinguishes collections of sites in network-in-name-only aggregations, experimentation networks, environmental monitoring networks, and integrated, long-term research networks. A table displays how individual LTER sites participate in many of these types of networks. We are clearly living in an era of networks, and nesting of networks within networks. This thick book offers a wealth of perspectives worthy of reflection. However, it is rather pricey at more than $200. Hayes, D.C., S.L. Stout, R.H. Crawford, A.P. Hoover.